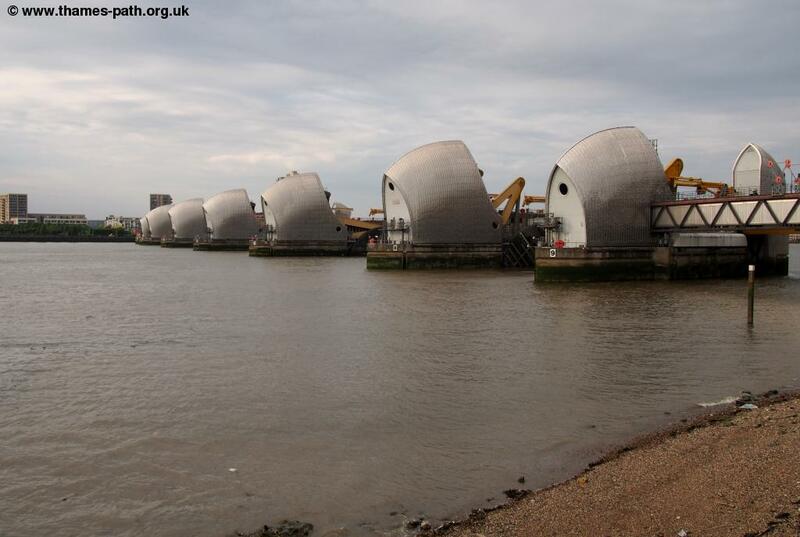 The impressive Thames flood barrier marks the start (or end) of the Thames Path National Trail as the river widens to the sea. 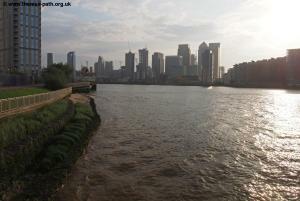 This walk heads in the other direction, upstream towards central London. 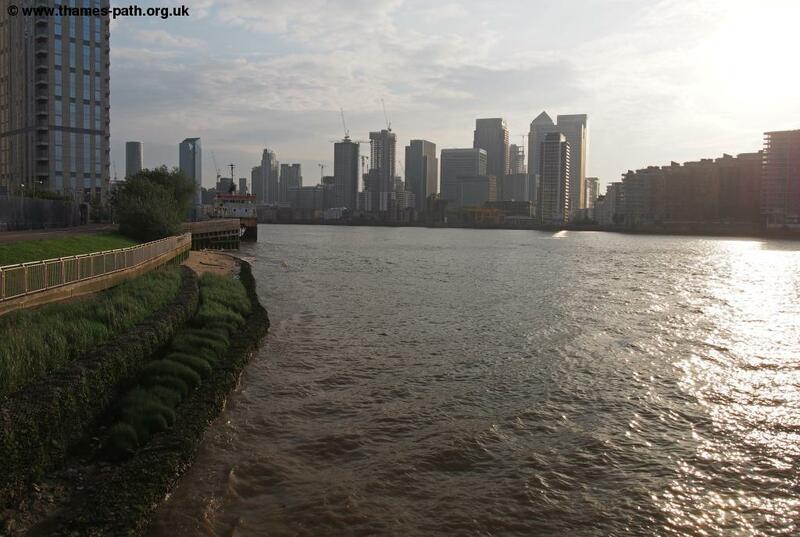 The Thames was once a busy working river and heading west from here you'll see that parts of it still are, as the walk goes through an area of industry. 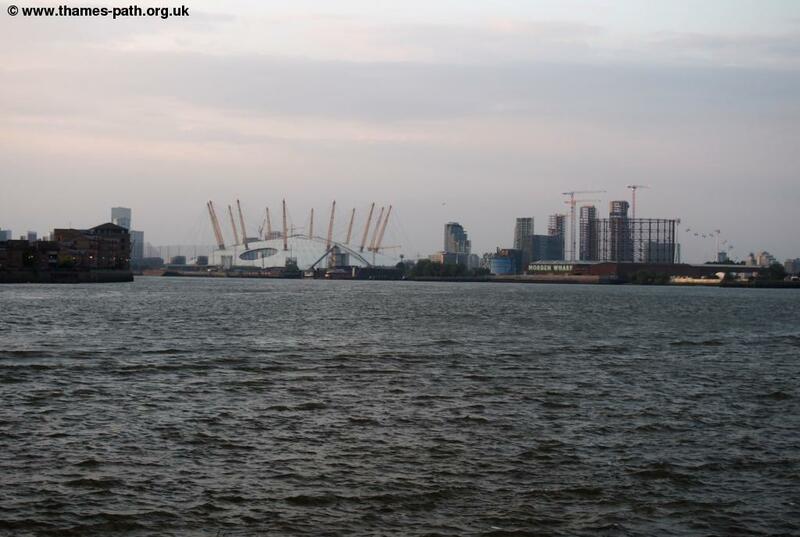 It then rounds the Greenwich Peninsula, rounding the O2 entertainment venue and continues through a new residential area to reach the historic centre, a World Heritage site. There is so much to see here it is well worth spending the time exploring. 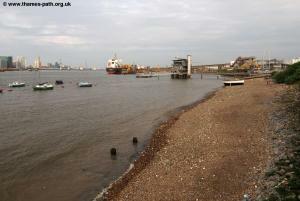 The walk starts from Charlton and it is easiest to reach there by public transport. Charlton station is located on the North Kent line and is a little under ¾ of a mile from the Thames barrier and the start of the path. 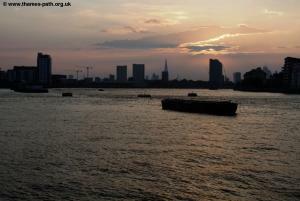 It has 8 trains each hour from London Bridge, taking less than 15 minutes. There are also 4 trains per hour from London Cannon Street and 2 per hour from London Charing Cross and London Waterloo East and also 2 per hour from London Blackfriars and London St Pancras. Most trains to and from Charlton are operated by South Eastern, however 2 trains per hour (those from Luton to Rainham via London St Pancras and London Blackfriars) are operated by Thameslink. If you are travelling by car from the M25 motorway exit onto the A2. As you approach London continue ahead onto the A102 Blackwall tunnel approach road and turn right onto the A206 and follow this into Charlton. There is a car park at the Thames Flood Barrier visitor centre though I believe it is only for visitors to the centre (and only whilst there). Therefore it is necessary to park on the road. Some of the roads followed on the walk from the station to the flood barrier have some unrestricted parking bays. 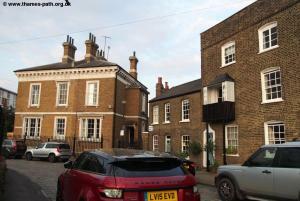 Otherwise, you can park along Westmoor Street, the road leading to the Thames barrier, however it does not look the safest area to leave a car, so do so at your own risk. 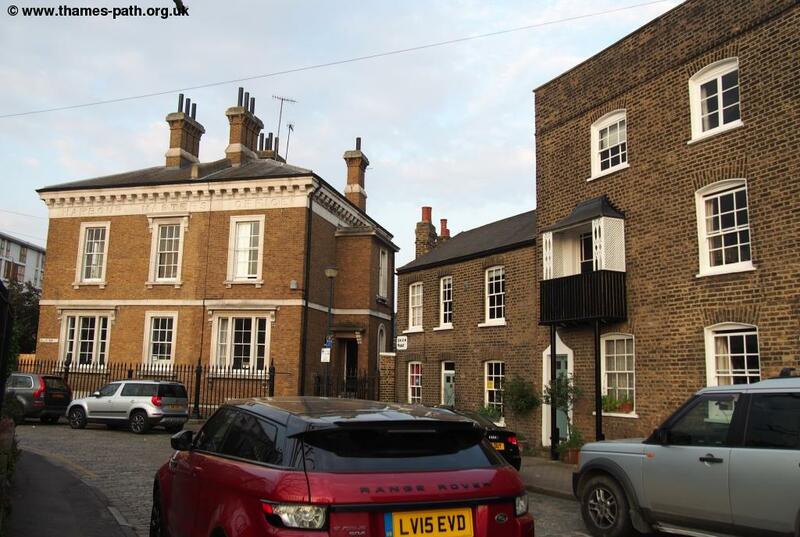 Or there are public car parks in Greenwich, the end of the walk, which is a few minutes by train from Charlton, with a very frequent service. From Charlton station exit onto Charlton Church Lane. Turn right and take the first road on the left, Floyd Road. At the T-junction at the end, turn left. Follow this road ahead which soon becomes Harvey Gardens and passes the entrance to Charlton Athletic football club on the right. At the end of this road turn left into Charlton Lane and continue to the level crossing, which you cross. It is best to be on the left hand side of the road here. On reaching the busy A206 ahead turn left and then cross this road via the pedestrian crossing. Once over, turn right to approach the roundabout, and turn left here along Westmoor Street. This street is lined with various car repair businesses and other industrial premiss. Unfortunately, many of the cars are parked on the pavement (in various states of repair or otherwise) so you might be forced to walk on the road here. 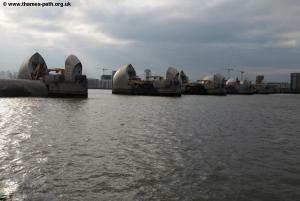 At the end of the road you approach the Thames flood barrier. Turn left here and then follow the path through the gardens to the river. If you go up the steps here just to the left of the main control building for the flood barrier you can turn right through the concrete subway under the building, which is open to the river on one side. 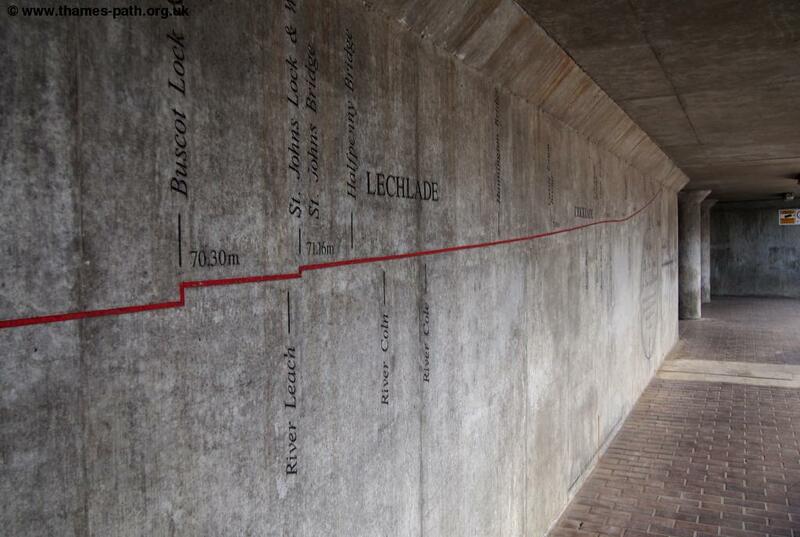 On the other, you'll find a map of the Thames on the wall showing the various towns on the length of the Thames and the height of the river above sea level. 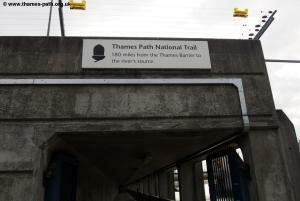 At the far end of the subway you have reached the official start of the Thames path. Here turn back through the subway and continue along the riverside path. Looking over the river you can see the glistening arches of the cowling of the Thames flood barrier and the Tate and Lyle factory on the other side of the river. 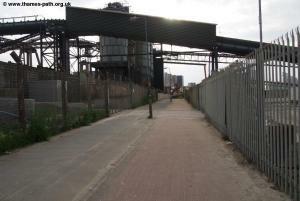 There is a block paved path along the river here for a short while but you soon enter an industrial area. 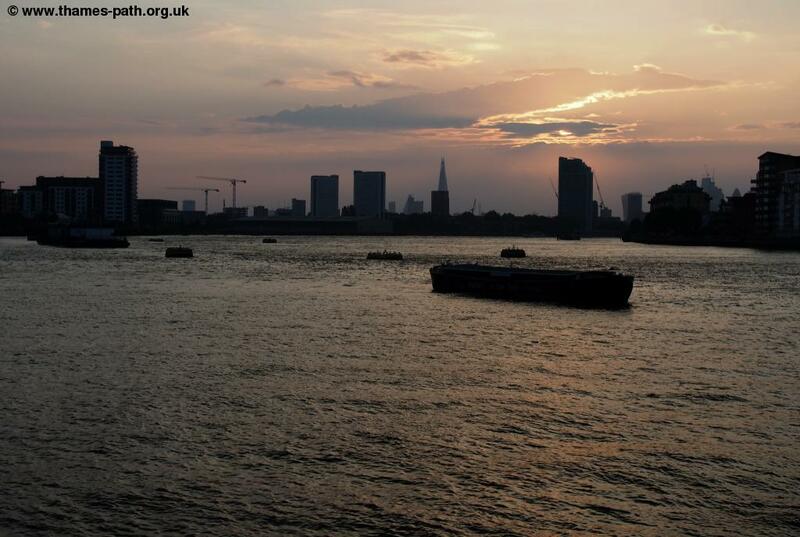 London like most cities grew here precisely because of the river because without railways, canals or roads this was the main mode of transport both for people and goods and much of the Thames would once have been lined with industry. 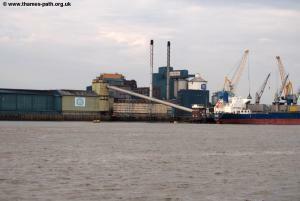 Now it has mostly moved further out of London but pockets of industry still remain, as ahead, where aggregates are loaded on and off boats, sometimes passing overhead on convey belts. The Thames path goes right through the middle of it all, with fences either side offering protection, but it's unusual to be able to walk through industry like this. After passing through this area you join a road ahead. Continue ahead along the road (Riverside) which although it lacks a pavement is lightly used by vehicles. When the road turns off to the left continue on ahead on a path back through the industry. 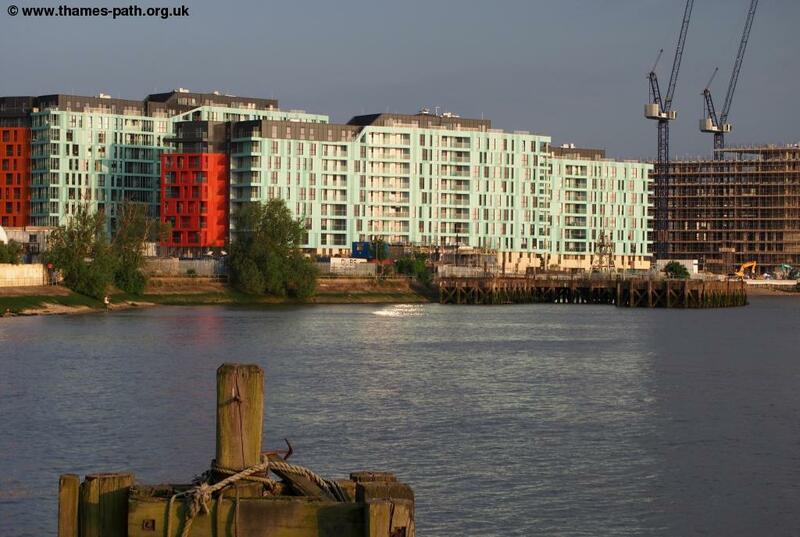 The path continues through some more wharfs and industry, but quite suddenly it emerges into a modern housing development, Greenwich Millennium village. 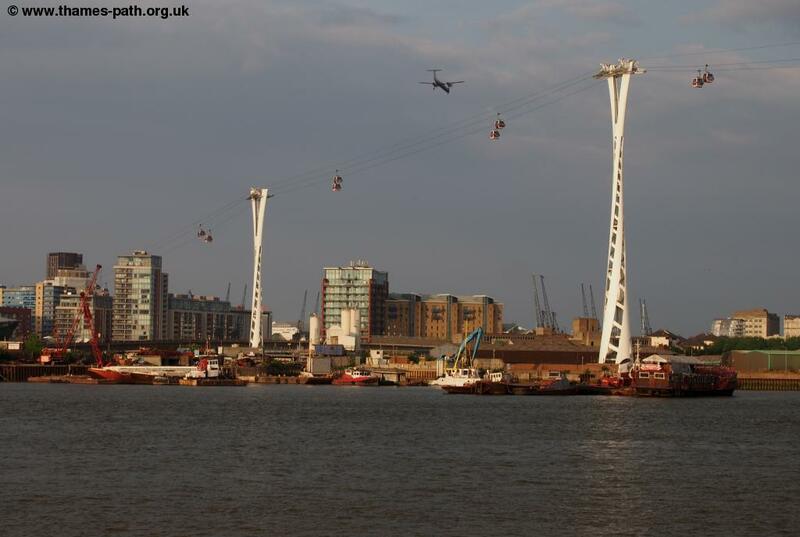 We are now reaching the Greenwich peninsula. 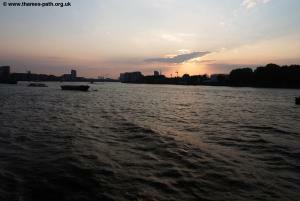 A narrow strip of land bounded on 3 sides by the Thames, which goes in a large loop here. 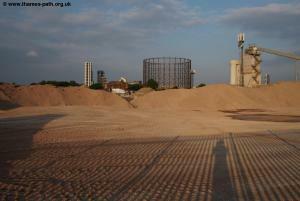 This was once a very industrial area and home to what was once the largest gas works in Europe. This reached it's height in the 1960s but went into decline after that. There was also a power station here and a riverside wharfs. 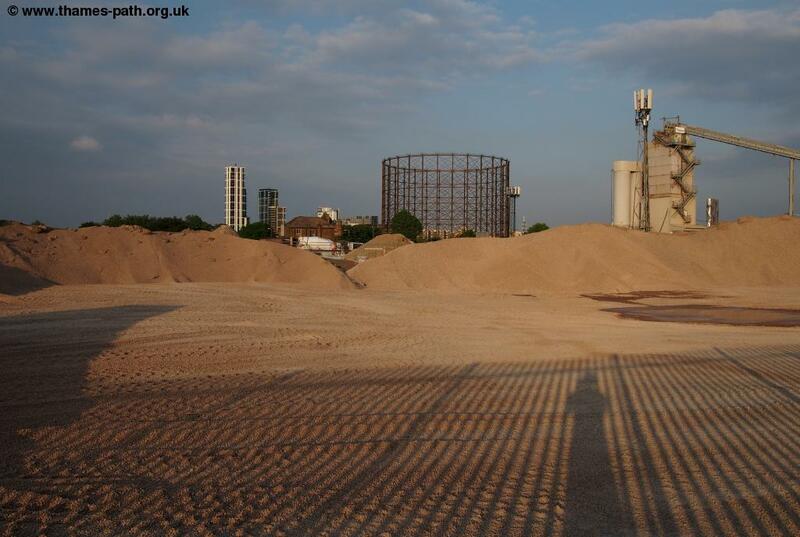 Closure of all these sites in the late 1900s meant most of the peninsula was a barren and contaminated waste land. That has all now changed. The opening of the Jubilee Line Extension of the London Underground in 1999 bought with it a fast and frequent connection to central London, and to the relatively new business district of Docklands. In addition new roads were constructed. 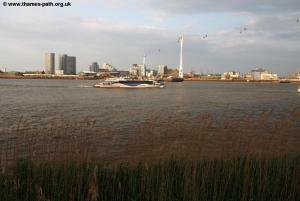 With the coming of improved transport links so the area began to be re-developed. 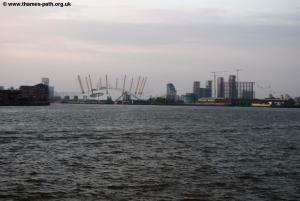 The millennium dome opened in 2000 and was never terribly successful as it's original tourist attraction but has since become successful as an events and concert arena and is now known as the O2. 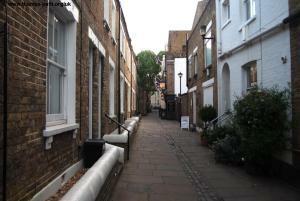 All in all this area has undergone a rapid transformation in recent years. Now the path ahead is through this new residential area. 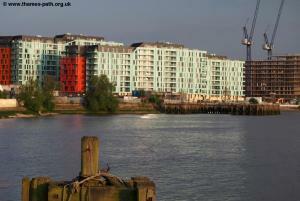 The industry has gone and now you find large blocks of flats with pleasant public gardens alongside the river front. Ahead too you will see another new transport link. 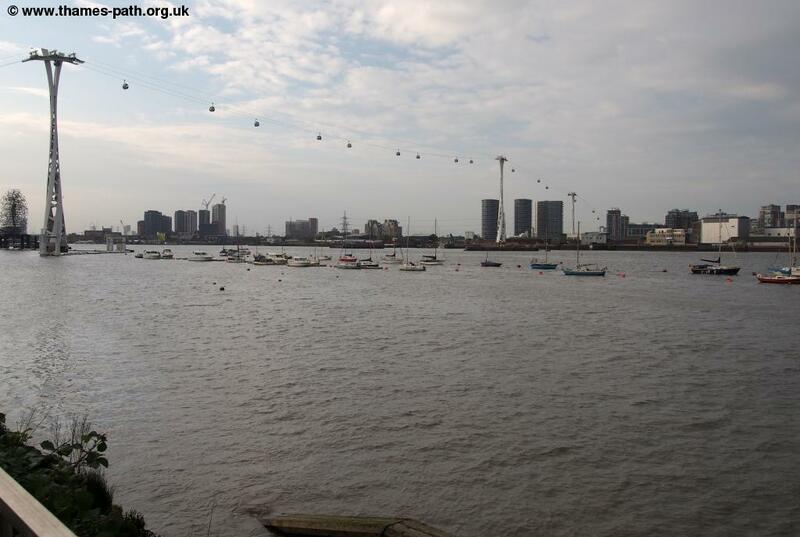 This is the Emirates Air line, a cable car which spans the Thames. This provides an alternative and more scenic way of crossing the Thames than the Jubilee line which passes underground. 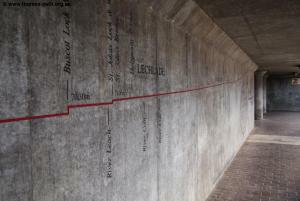 It is part of the London transport system, but additional fares apply. 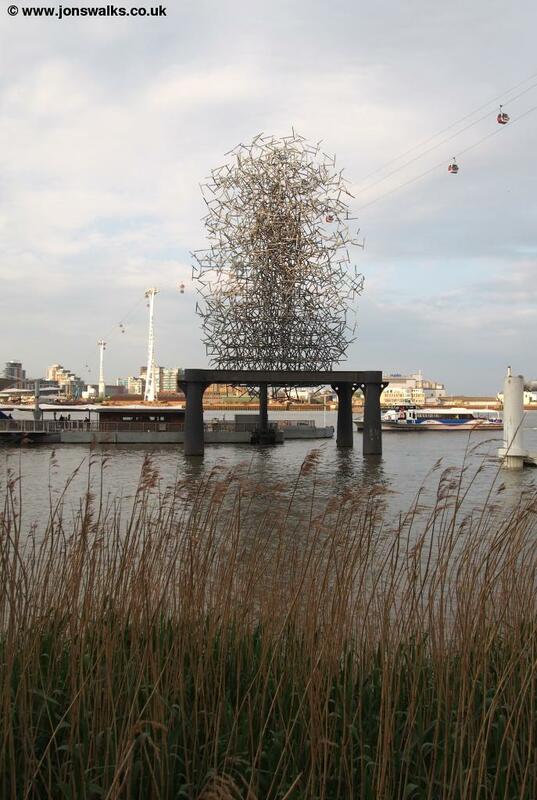 It has never been very popular with commuters or locals because the Jubilee line is a faster, cheaper and more frequent way to cross the Thames and so it is largely a tourist attraction despite the claims of it's backer, the then Major of London, Boris Johnson. 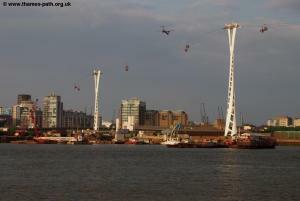 Continue under the cable car and beyond this you come to North Greenwich pier. Another fairly recent addition to the transport infrastructure, from here regular fast boat services operate along the Thames into central London, and to Woolwich in the other direction. 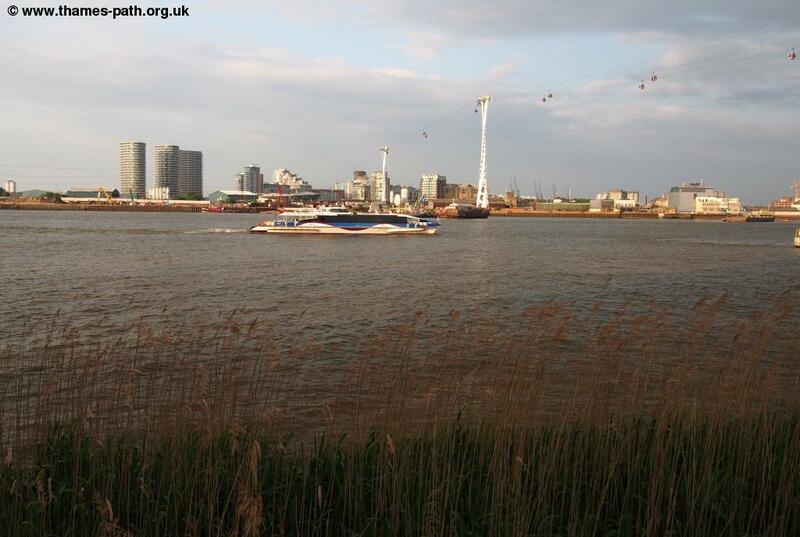 Continue ahead on the path and you are now alongside the O2. 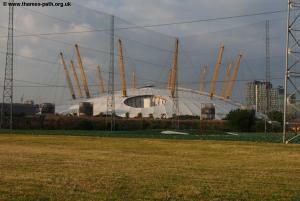 Formerly the Millennium dome, it was never very successful as it's original purpose of a tourist attraction but has now becomes a venue for concerts and events, which has proven far more successful. The dome occupies most of the far end of the Greenwich peninsula though the path goes all around the edge of the dome here so you have fine views of the Thames. 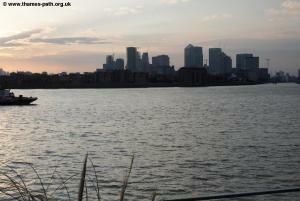 As you round the corner you now have views of the Docklands area. As the name suggests this was once an area of docks, which had originally moved here from more central London. 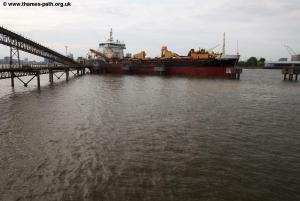 These fell into decline as larger container ships became more popular that needed deeper water (there is now a large container port, the Port of London, which despite the name is just outside London in Essex). 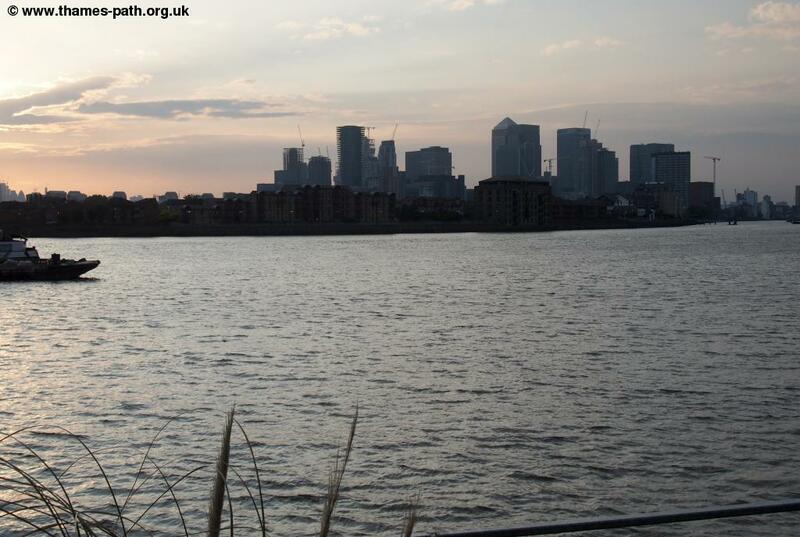 As much of the docks became derelict another regeneration project in the 1980s prompted large scale redevelopment with the construction of numerous sky-scrapers the largest of which (One Canada Square) was at the time the tallest building in the UK (and is still the second tallest today). To provide access to all this new development the driver-less Docklands Light Railway opened which has proved very successful and been extended and improved many times since. This area is now the headquarters of several large banks and is now another financial centre, alongside the city of London. Sadly the area around the dome is largely fenced from the Thames path so you must continue on the path along the river until you have passed the large Intercontinental hotel. 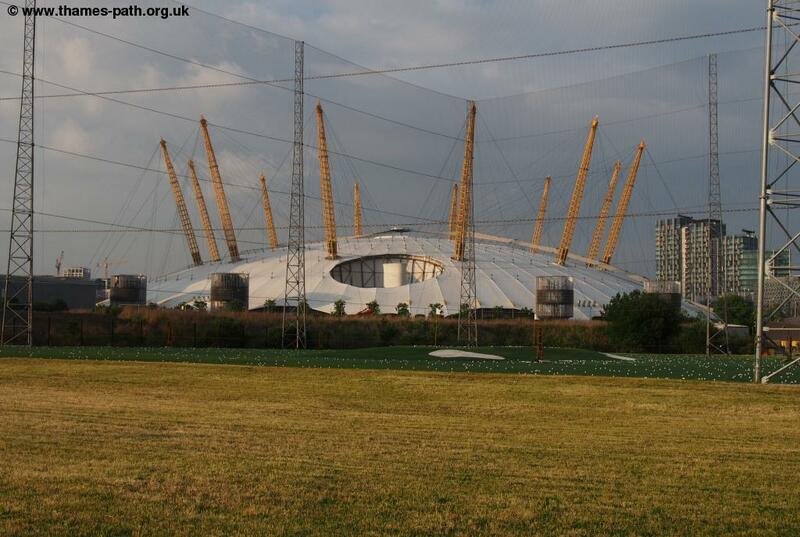 Beyond this you then pass the Greenwich Peninsula Golf Range where golfers can practice in sight of the Thames and docklands. Beyond this the path then enters an area of dead and dying industry. 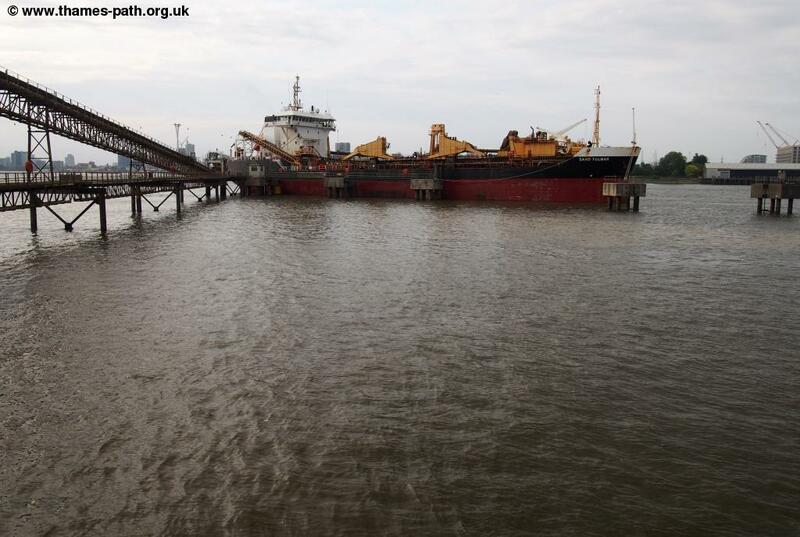 There are more aggregate wharves here, alongside derelict sites. The area is always changing and soon this too is likely to be a large residential development. 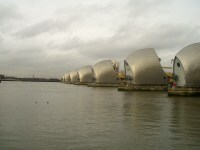 At the time of writing a short distance along here the Thames path is diverted due to new development, but the normal route is to continue alongside the river. Pass Morden Wharf where you reach the area that is currently (2018) subject to development. Once past this, the path continues mostly along the water front. As you approach Greenwich you are passing along historic cobbled streets, past beautiful houses (one is the old Harbour Masters office) and nice pubs. 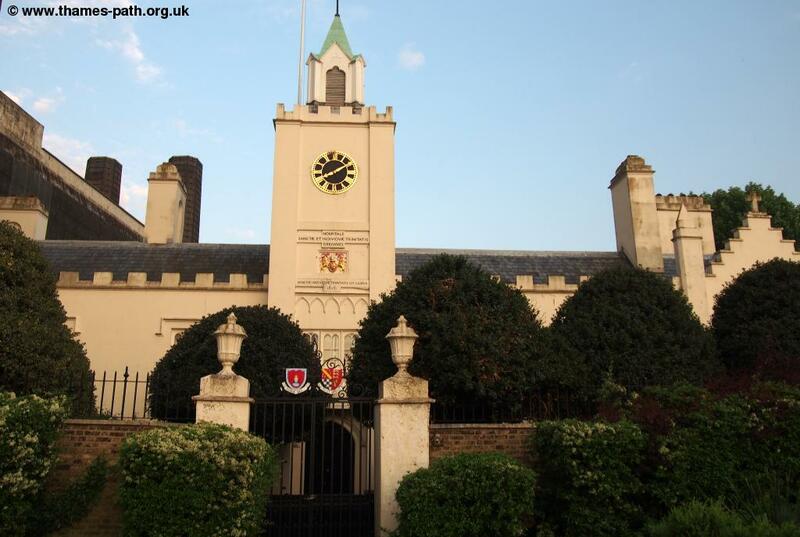 You pass the Trinity Hospital Building which dates from 1616 and is the oldest building in Greenwich. 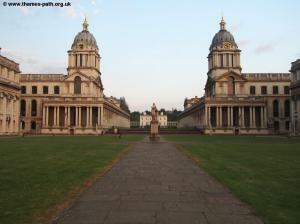 You soon emerge at the Old Royal Naval College at Greenwich. 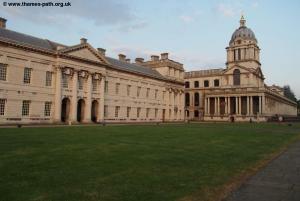 Greenwich is a world heritage site and there is a lot that is well worth visiting here. The Naval college closed in 1998 . Now it has a variety of uses, including partly a University as well as business and commercial activities. It is a wonderful and spacious site beautifully located along the Thames and you can look inland through the buildings to the Queens House and the Royal Observatory (home of the Greenwich meridian). 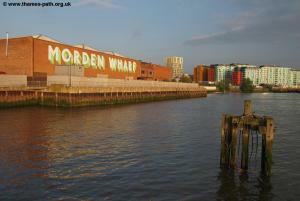 This is now a museum that is well worth a visit and also on its hill-top location offers fine views over the Thames. 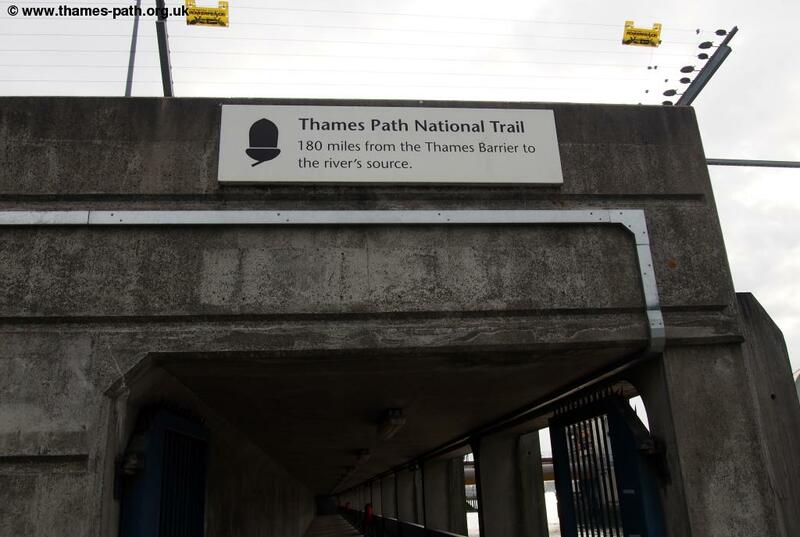 Here you have a choice of routes either along the Thames path (which is fenced from the rest of the complex) or within the old college site where there is also a path on the other side of the fence. 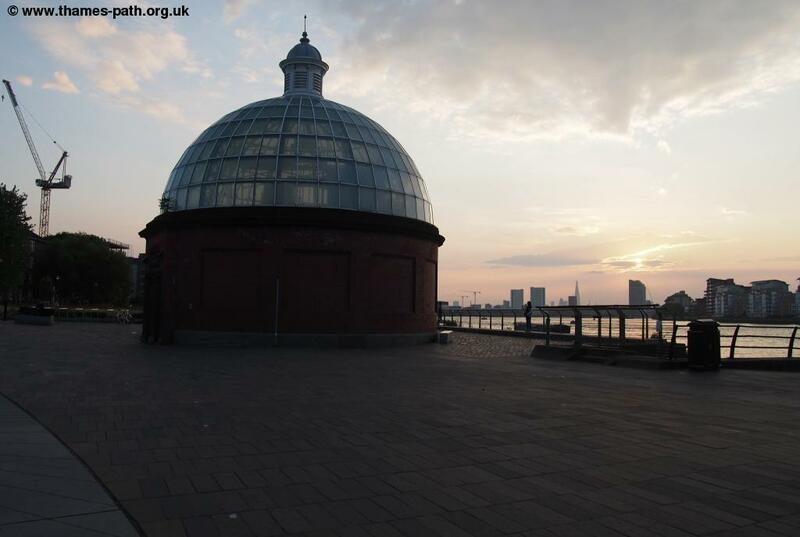 Continue on to Greenwich pier and the domed building beyond, which is the southern entrance to the Greenwich foot tunnel, which crosses the Thames here. 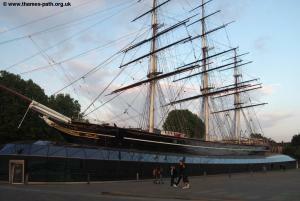 Just beyond this is the restored ship the Cutty Sark. This was a tea clipper ship built in 1869 and was used to transport tea from China and later wool from Australia to London and held the record time for the fastest crossing to Britain for 10 years. She was moved to permanent display here beside the Thames in 1954 and is another attraction that is well worth a visit. 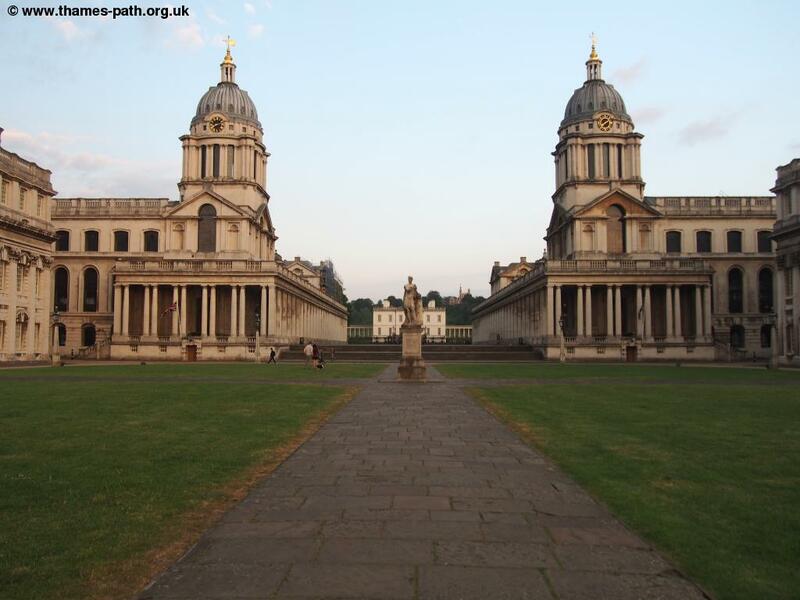 There is so much to see in Greenwich that the walk ends here. 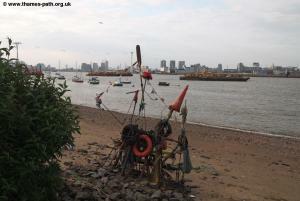 Just inland from the Cutty Sark you will find ¿Cutty Sark (for Maritime Greenwich)¿ DLR station where the walk ends.